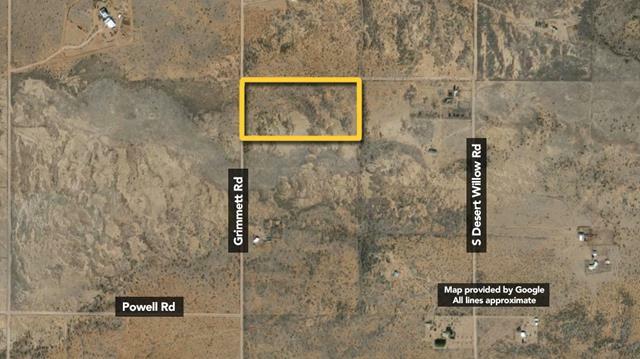 Desirable location with easy access off Hwy 181, this 20+/- acres of vacant land is located on Grimmet Road in Cochise County, AZ, part of Ash Creek Ranch subdivision. Property has 360 degree views of Chiracahua, Dos Cabezas and Dragoon Mountains along with several hills. Nice level land with close access to hiking, horseback riding and camping. Zoned RU-4. Horses allowed. Utilities approx. 600' from property. 2016 approx. taxes of $488.22. Quick Close Available. Buyer can save title/closing costs by paying in full (including any buyer paid fees) on day of sale. See property specific Disclosures for details. Property can be viewed at your convenience during daylight hours. Note: A Buyer’s Premium (Buyer’s Fee in WI) will apply for this property. Buyer pays a $199 Technology Fee at closing. Please see Terms of Sale for details. From Tucson, AZ: East on Hwy 10 approx 53 miles to Dragoon Rd (Exit 318). Continue East on Dragoon Rd approx 12 mi to US-191. South approx 17.5 mi to AZ-181 E. East approx 4.4 mi to Ft Bowie Rd. South approx 0.3 mi to Lydy Ave. East approx 0.3 mi to Grimmet Rd. South approx 0.8 mi to property. Thank you for participating in Williams & Williams Online Auctions. It is important that you familiarize yourself with the terms and conditions as all sales are final and irrevocable. The terms of sale are non-negotiable. Good luck and good bidding! Registration at the auction (online and/or in person) finalizes each bidder's agreement to the terms and conditions of sale as stated in the Contract and its Addenda which are incorporated by reference into your bidding. Do not bid until you have read the terms and conditions. In order to bid on the auction items, all Bidders must be signed up as Members of williamsauction.com and register to bid on the specific property in question. There is no fee to register although a valid credit card will be required to verify identity and funds and the High Bidder will be required to pay a Williams & Williams Technology Fee of $199 at closing. By bidding you are representing to Williams & Williams ("Broker" and/or "Auctioneer") and the seller that you have read and agree to be bound by the terms and conditions for this sale as stated herein.. DO NOT BID unless you have read and agreed to be bound by the terms of sale in the Contract as they are enforceable against you upon becoming a high bidder. THE SALE WILL BE CONTROLLED BY THE AUCTIONEER PROGRAM.Williams & Williams is not responsible for malfunctions or system errors which cause a bid or bidder to fail to be recognized or registered. If there is a dispute, the Auctioneer may re-open the bidding at the Auctioneer's sole discretion and shall serve as the sole arbiter as to who is or is not allowed to bid. The Auctioneer reserves the right to group, add to, delete, withdraw, consolidate or break down properties or quantities offered, to sell out of scheduled sequence, to reject any bid which is only a fraction advance over the preceding bid, to regulate bidding and to accept or reject any or all bids. Absentee bids may be accepted at the discretion of the Auctioneer. Any and all decisions of the Auctioneer regarding the order and conduct of the auction shall be final and absolute without liability to any party. Seller reserves the right to cancel or withdraw any property at any time. All properties offered for sale at auction under the "ABSOLUTE" or "WITHOUT RESERVE" designations are being offered for sale without reserve (i.e.) for the high bid price in each instance and are not subject to subsequent approval by any third party. All other auctions are subject to court or seller approval unless otherwise provided in the Contract and Auction Day Notes. Possession is not granted until filing of the deed at which time the property should be re-keyed. [Any mobile/manufactured housing on property will only be conveyed by a Hold Harmless Agreement or Quit Claim Bill of Sale unless otherwise noted]. Bidding starts at the nominal Opening Bid(s) indicated and is open to all who registered and are approved. The Auctioneer will call the sale and control any increments of bidding. The bidding will continue for a period of five (5) to seven (7) days for each property. The auction ends at a predetermined time with an Overtime Period if necessary, which is defined as follows: if a bid is placed within three (3) minutes of the close of bidding, then another three (3) minute period commences from the time of the last bid until no bids are placed within the next three (3) minutes. The last bid shall be made final. An Auction Services Fee of $1,500 OR a Buyer's Premium (Buyer's Fee in WI) of 5% ($1,500 minimum) will be added to the high bid and included in the total purchase price. Please see the Auction Day Notes, The Contract for Sale, and/or the Auctioneer for specifics about the property you wish to bid on. Each high bidder must make a 10% non-refundable deposit per property ($5,000 MINIMUM - whichever is greater) at the conclusion of the auction. Electronic wire funds, ACH Debits, and cashier's checks are the only forms of payment accepted. If you are a resident / citizen of a country outside of the US, certified funds (bank check, wire transfer, certified checks) are required for the down payment and closing. Once the Seller approves the Sale, the deposit will be credited to the Contract. The balance of the purchase price all closing costs, and the Technology Fee are due at closing. Closing costs generally total approximately $1,400 and include title exam, title policy, closing fee, filing costs and any other fees noted. Deposits will not be forwarded to any title company, or other party, for closing until WW's bank has received "cleared funds" for the deposit. Within 24 hours immediately following the close of the auction, Auctioneer or Title Company shall contact Buyer by electronic mail, telephone or facsimile to provide documents for execution. All purchase documents will be provided to the Buyer and Buyer will be required to sign and return all purchase documents to Auctioneer via overnight delivery. Buyer shall have two (2) days following the auction to return all completed documents or shall be subject to paying a liquidated damages amount equal to the down payment. If you wish to have the purchase documents reviewed by an attorney, please contact Auctioneer PRIOR to the Auction and we will provide them to you for review so as to not delay the post auction process. You may also obtain a copy of our current contract on our website at www.williamsauction.com. The contract is not subject to negotiation. If Buyer is a winning bidder and refuses or fails to complete the transaction for ANY reason (including, but not limited to, remitting the total purchase amount), Buyer shall relinquish ANY right to complete the transaction and shall have no rights or interest in the property, as well as forfeit all deposit monies as liquidated damages to Seller. PLEASE BE ADVISED: Various state statutes give Seller the right to pursue legal action against bidders who refuse to complete transactions. This may include (but is not limited to) suit to compel completion of the sale, and/or criminal charges of fraud or other intentional act. All properties are sold "AS IS, WHERE IS" with no financing, inspection or other contingencies to sale. Williams & Williams represents the Sellers only and does not inspect properties on bidder's behalf. Buyers must conduct their own due diligence and investigation of each property and must also investigate the suitability of each parcel prior to making a bid and purchase at the auction. Buyers must rely solely upon their own investigation and not any information provided by the Seller or Auctioneer. Failure of a Buyer to be fully informed on the condition of a property will not constitute grounds for any claim adjustment or right to cancel sale. All the information contained on this property was obtained from official county maps or other sources deemed reliable, but is not guaranteed and may be in error. Seller DOES NOT WARRANT the accuracy thereof. Seller has made no independent investigation of any information provided, and assumes no responsibility for the providing of or absence of any information, whatsoever, or for the accuracy thereof. NOTICE: Institutional and Fiduciary Sellers (courts, government agencies, banks and trustees) have not occupied the properties and have NO information to provide for disclosure. Properties are sold 'As Is - Where Is' and should be fully inspected prior to bidding on. SELLER AND AUCTION COMPANY HAVE NO KNOWLEDGE OF THE SUBJECT PROPERTY OR ITS FIXTURES OR CONDITION AND ARE NOT RESPONSIBLE FOR SUCH. YOU ARE ENTERING INTO A BINDING CONTRACT. THERE ARE NO REFUNDS OR BID CANCELLATIONS. THE REGISTERED BIDDER IS PERSONALLY RESPONSIBLE, LEGALLY AND FINANCIALLY FOR ALL AUCTION ITEMS BID UPON WHETHER REPRESENTING ONE'S SELF OR ACTING AS AN AGENT. AN ONLINE BID ACCEPTED AT PUBLIC AUCTION IS A LEGAL AND BINDING CONTRACT TO PURCHASE. ANY BIDDER WHO FAILS TO CONSUMATE A PURCHASE WILL BE BANNED FROM BIDDING AT ALL FUTURE SELLER AUCTION EVENTS AND MAY BE PURSUED FOR CIVIL AND/OR CRIMINAL VIOLATIONS. • Property is located within territory in the vicinity of a military airport and may be subject to increased noise and accident potential. • Quick Close Disclosure. Seller is offering Quick Close terms for this Property. The following shall apply if Buyer wishes to use the Quick Close Option: Buyer must pay the Purchase Price and any Buyer's Premium, Service Fee, and/or other announced Buyer paid fees in full at the time of execution of the Contract for Sale in order to qualify for the Quick Close program. If Buyer makes said payments, Seller shall pay Buyer's customary costs associated with a cash purchase for the Property. These costs include the closing fee, flood certification, title search/abstract, title review, title policy premium, tax search, UCC and bankruptcy searches, transfer taxes, deed preparation and recording fees. Seller shall have no obligation to pay any fees associated with financing qualifications or city, county, or state inspections. Within five (5) days of the execution of the Contract for Sale, Buyer shall make all necessary arrangements with the Closer identified above to execute all required documents for Closing. If the Closer requires additional time to complete the necessary documentation for closing, Buyer agrees that it shall complete the closing within forty-eight (48) hours of the Closer's clear to close notice. Lot size per county records.